The following chart will show an enlargement of the circle in Chart 1. 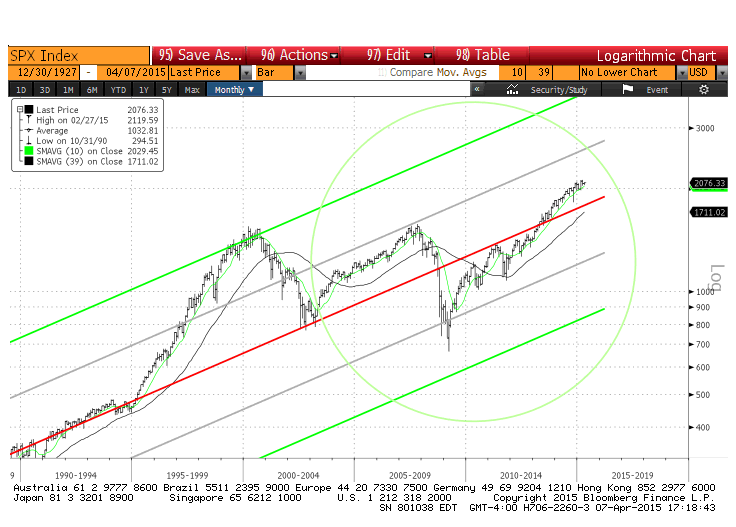 As you can see, we are slowly but surely getting further from the red line: 13.5% above the line. 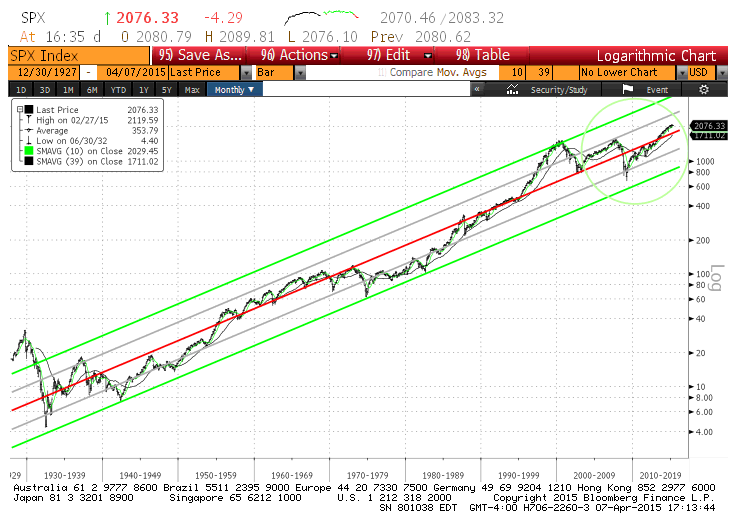 So last year’s comment still stands: the market is no longer undervalued today. Although it does not mean that it is currently expensive or there’s a crash coming, it does imply that bargains are harder to come by and corrections could become more frequent and more violent. We received a lot of questions related to the Loonie and its weakness versus the US dollar. We decided to look back 45 years and see whether we can come up with any intelligent comments (there is no point going back further since the Canadian currency was fixed and pegged to the US dollar at 1.0811 from 1962 to 1970). 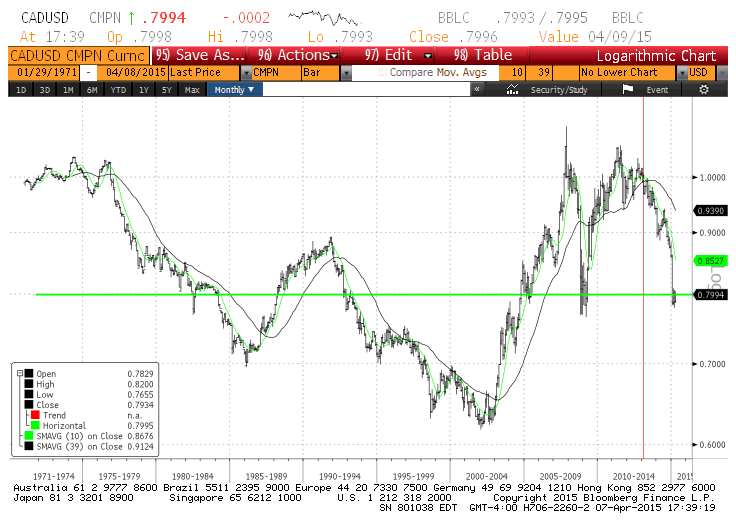 As you can see from Chart 3, the green line indicates what the Loonie is worth today versus the US dollar: 0.80. You can also observe that it is pretty much right in the middle of the 45 year range. Since we are not very good at forecasting in general, it seems to us that there is not much money to be made if we are to be long term investors due to the tendency for prices to “revert to the mean”. We actually went further in our analysis and calculated the hypothetical return of buying the Canadian dollar around these prices and holding it for 5 years (about the length of our holding period for stocks we buy). Since 1971, there were 61 instances where you could buy the Canadian dollar at around 80 cents US (from 0.775 to 0.825).The average return of these 61 investments over the 5 year period was around 0.3%, i.e. less than 0.1% annually. Worse, these returns fluctuated between making 4.3% a year to losing 3.2% a year. In betting terms, this represents really lousy odds and lousy payouts. In short, we would not pay too much attention to the currency fluctuation at these levels and rely instead on our fundamental analysis and research. We will buy bargains wherever we find them. We did mention previously that most people will be surprised by the behavior of interest rates over the next while. They always go lower than most believe and stay low a lot longer. Conversely, when they do rise, they go a lot higher and a lot faster than most people think. From a long term perspective (5 years and more), we think the worst investments are anything related to interest rates, especially long term bonds. A 5-year government of Canada bond is yielding 0.76% annually. A 10-year is at 1.34%. Most investors do not realize that over the last several years, returns from fixed-income securities (bonds, debentures etc…) came from the effect of declining interest rates. How do you think managers of fixed-income mutual funds can report 7% or 8% returns when the average coupon on the bonds they hold are no more than 2%? (for further details, please refer to our quarterly letter of July 18, 2014). We are not implying that nobody can make money trading bonds (or should we say speculating in them), we are merely saying that one would have to be quite nimble to come out ahead. In other words, the odds are not good enough for us. At Claret, we are not skillful in frequently getting in and out of the markets. We prefer “the fat pitches”, as Warren Buffett puts it. Remember, there are no strikeouts as in baseball. We only have to wait for the perfect pitch and then swing. In short, we just have to be patient and diligent in our research. For your information, your quarterly report has been available for some time in an electronic format. For those of you who would like to save some trees, please contact us by e-mail and a web folder will be set up for you on our password protected client extranet. You will be notified by e-mail whenever a quarterly report is uploaded in your web folder.